When I was growing up, every year beginning in early November, my mother and I went to work on hand-crafted Christmas ornaments. Mama is an expert in the D.I.Y. department. She can sew anything, upholster, refinish furniture and floors, paint, wallpaper, set tile, gold-leaf frames, create really lovely silk flowers, and man, is she a whizz at Christmas ornaments. As the first cool breeze of fall could be felt in Atlanta, she was bursting with ideas she had picked up from magazines, craft programs on TV, and her own lively imagination. So, like Santa’s elves, we worked. Mama and I hand-stitched many ornaments from brightly colored felt: candy cane stick horses, stuffed angels, Rudolfs, and tiny Raggedy Ann & Andy dolls. There were mice peeking out of stockings, as well as free-standing mice dressed as Santa, Mrs. Claus and elves. One year we produced a huge outpouring of painted bread dough ornaments. These didn’t last for more than a few seasons due to insect invasions. When I was about twelve Mama ordered a big set of pre-cut wooden ornaments for me to paint. Then there were the clothespin toy soldiers and the drums made from spools. I returned from college one December to find that my father had gotten into holiday crafting spirit. His specialty was the adorable pasta angel (rigatoni body, bowtie wings, anellini or stellini hair), and he turned out quite a crowd. We shared our ornaments with friends and relatives, often tying them onto gifts, and there were always many left over for us. One year when Daddy took a rare out-of-state business trip (he went to Reno, and I still have the postcard he sent me), Mama decided we should undertake an especially ambitious project: ornaments resembling stained glass. The “lead” framing was a stiff bread dough that we attempted, with much difficulty, to force out of a pastry gun. The “glass” was formed from melted, cracked hard candy (we used a mallet to beat the candy, wrapped in a tea towel, on the kitchen counter). This was a project that required the unlikely combination of brute strength and extreme patience. I’m not saying we weren’t up to the job. We got it done, but it took its toll. Mama remembers that I stormed out of the kitchen at one point, around 2AM, yelling about the violation of child labor laws. But I came back in, and sometime before dawn, we finished the last ornament. They really did look like stained glass, and they were beautiful. But I’m not sure if they were worth it. Due to the flurry of holiday preparations, as well as our family tendency toward holiday illness, I know I won’t be writing much, so I’ll devote the next few posts to photos of some of our favorite homemade Christmas ornaments. 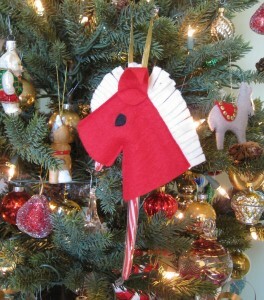 The felt and candy-cane stick horse. throughout our Atlanta neighborhood during the 70s. Does your family have a tradition of home-made ornaments? Childhood memories of making ornaments under duress? Let me know!